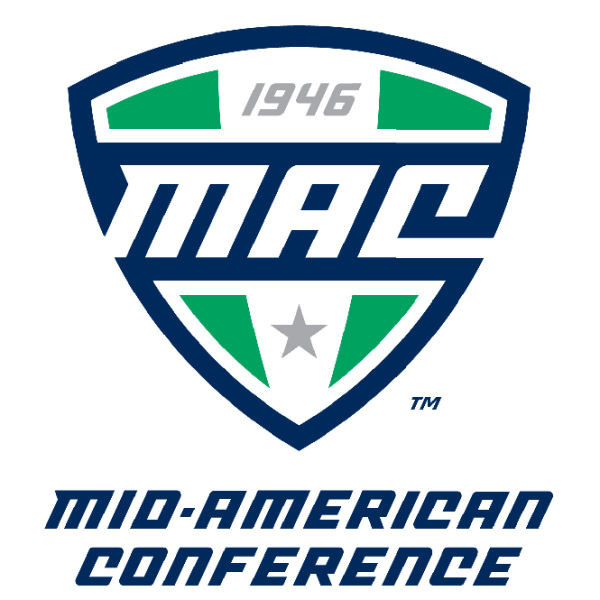 Media day is MACtion when there’s no other MACtion to be had. The season is fast approaching. Which is nice because these Saturdays where I’m expected to be “productive” or “helpful” or “sober” are getting tiresome. The media (even ESPN!) is getting an up close and personal look at the MAC and the teams and coaches within it and sharing that view with the world. Always nice to see the MAC take center stage on a day that isn’t a Tuesday night at 8. Though that would be fitting for MAC Media Day. 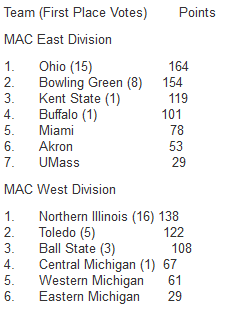 The MAC media has released their preseason poll. Let’s take a look at that, shall we? I thought about getting on here and blasting the media members that voted (assuming those folks’ names are ever released) but alas, I can’t really disagree with any of it. The gap between Toledo and BSU in the West is small enough that it’s really splitting hairs whether or not you put BSU 2 and Toledo 3 or vice versa, the fact remains that the West for all intents and purposes is NIU’s to lose. In the East, the only thing that seems concrete is the bottom 5, as much like Toledo/BSU there seems to be some grouping for the top between Ohio and BG. Though I enjoy flying off the handle at times, this doesn’t seem like the right time to do it. Until I can see some live data in terms of on-field performance, the opinion of the media is just as wildly speculative as mine. Carter over at EagleTotem did a blogger preseason poll and such and you can check that out here. It’s a small sample size of some of the MAC blogs, and no, we didn’t participate. Not because we don’t play well with others (though we don’t) it just was piss poor timing on our part. If we had, our list would look remarkably similar to the media above with a couple exceptions like BSU 2nd in the West and Buffalo 6th in the East. Why? Because they’re Buffalo.